Fashion Makeover | Outlet Shopping Scoop. Never Pay Retail Again. Is it time for a change? Have you, or someone you know, been through a challenging time and need a fresh new start? Would a fashion makeover be just the right thing to get you back on track? Then the Outlets of Colorado can help. 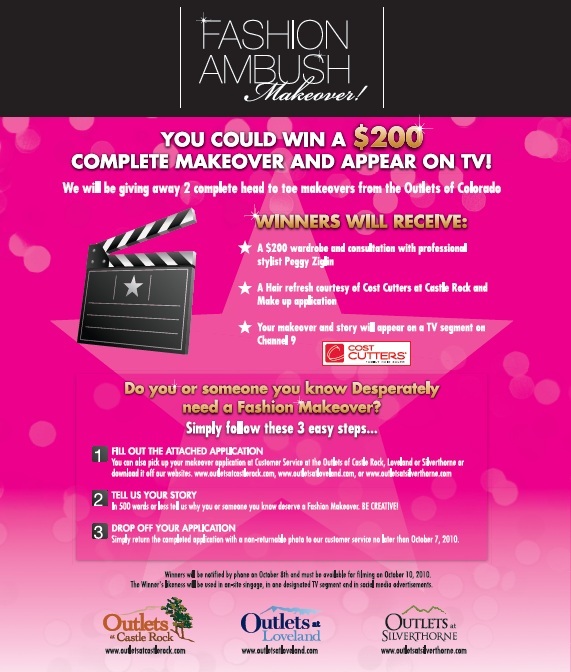 The Outlets at Castle Rock, Loveland, and Silverthorne are hosting a Fashion Ambush Makeover! and two lucky people will receive a $200 fashion makeover and a chance to be on TV during an upcoming fashion segment on Channel 9. To apply, bring a completed application to one of the Customer Service Desk at the Outlets at Castle Rock, Loveland, and Silverthorne. Click here for an application or stop by one of our Customer Service Desks and pick up your application.